Are you coming to Fertility Fest? 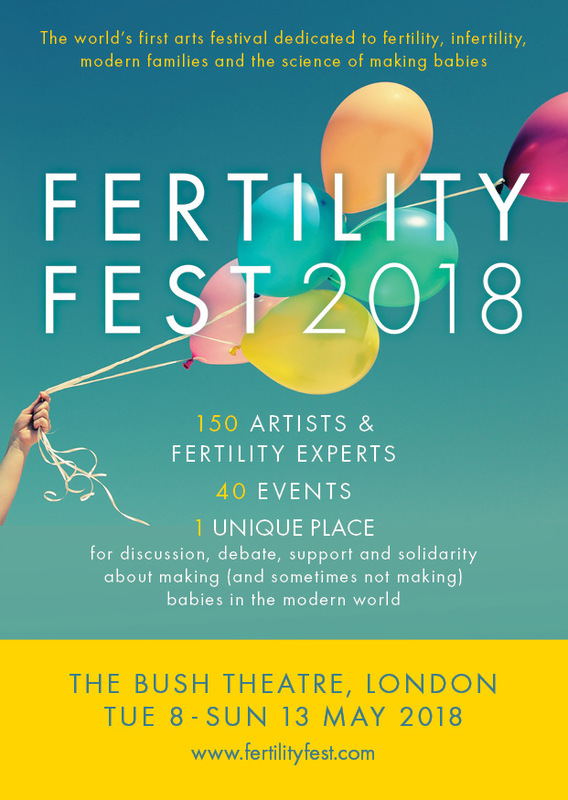 Fertility Fest is the world’s first arts festival dedicated to fertility, infertility, modern families and the science of making babies – and you really ought to be there! It promises 150 artists and fertility experts in a week-long programme of events, entertainment, discussion, debate, support and solidarity. It runs from 8 – 13 May at the Bush Theatre in London, and has the most amazing array of sessions. You will find Izzy Judd – wife of McFly’s Harry Judd and author of the bestselling memoir Dare to Dream – talking about their experiences of fertility treatment and trying to conceive. There’s a session on the often overlooked male experience of infertility with a screening of a film about a man whose relationship breaks down as a result of infertility and a documentary film about men’s experiences of infertility. You could listen to poet Julia Copus performing her poetry cycle which was shortlisted for the Ted Hughes Award or film-maker Katie Barlow sharing excerpts from her ongoing documentary film-project. In a session on pregnancy loss, award-winning visual artists Foz Foster and Tabitha Moses will explore their experiences with Professor Lesley Regan, President of the Royal College of Obstetricians and Gynaecologists and one of the world’s leading voices on miscarriage. And on Wednesday 9th May, there’s a special event entitled ‘There’s More To Life Than Having Children’ hosted and chaired by Fertility Network UK’s Catherine Strawbridge. One exciting series during the festival is the ‘Fertility Fight Club’ in which leading artists and fertility experts including Professor Geeta Nargund (from Create Fertility), Jody Day (Founder of Gateway Women the friendship and support network for childless women) and writer and theatre-maker Stella Duffy will give ten minute provocative talks about things they want to change about the world of fertility and infertility. These will be live streamed so that people can participate from their armchair at home and from anywhere around the world. This entry was posted in Advice and support and tagged Bush Theatre, Catherine Strawbridge, Dare to Dream, Fertility Fest, Fertility Fight Club, Fertilty Network UK, Gateway Women, Harry Judd, Izzy Judd, Jody Day, Julia Copus, Katie Barlow, McFly, Professor Geeta Nargund, professor lesley regan, Royal College of Obstetricians and Gynaecologists., Stella Duffy by fertilitymatters. Bookmark the permalink.